When we introduced Thinkbaby over 4 years ago, 95% of the baby bottles on the market were made of polycarbonate, which contains BPA. We attempted to convince the major companies to remove polycarbonate from their products. After being unsuccessful, we launched Thinkbaby and Thinksport to address the concern of chemicals leaching from consumer products. We started with the baby bottle, because polycarbonate was ubiquitous across the industry. As babies' systems are in a state of development, they have very little defense against foreign chemicals. Many bottles still contain BPA despite saying "BPA Free" (see Health Canada study). Thinkbaby utilizes the precautionary principle in the creation of our products. We don't jump to "new" materials without doing the requisite testing to ensure that we haven't landed on another "BPA-like" material. Thinkbaby and Thinksport's focus has led us to be the first company to span safe consumer products ranging from babies to adults. 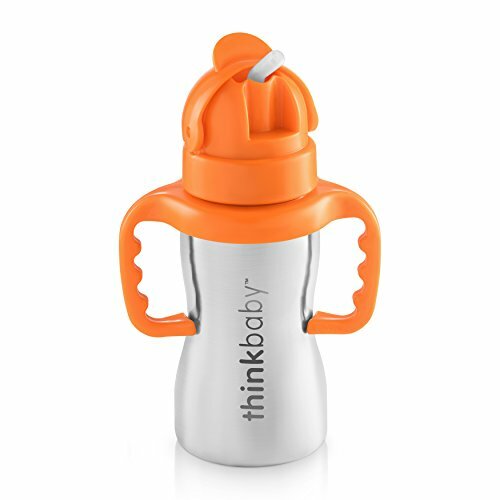 We built the Thinkbaby straw bottle with a soft silicone straw. This makes it perfect for the advancement into the next stage of feeding. The straw features a cross-cut design so liquids do not spill when the bottle is held upside down. The top of the bottle features an easy to close cover to keep it from coming into contact with foreign substances. The Sippy cup and Thinkster have won numerous awards. The Thinkster is made from No. 5 plastic and can be recycled after use. We do not use clear plastic windows with our products. We have found that these windows are made from PET or PVC. One of the great things about the Thinkbaby system is that you can convert the bottles to the next stage of feeding. The Baby bottle becomes The Sippy which becomes The Thinkster. Simply purchase the Thinkster Conversion kit. Take the collar off of the baby bottle (along with the spout) and screw on the Thinkster top. Presto change - The Thinkster.